Please call owner Jessica at 707-464-2169 or 707-458-9826. Boat is in Crescent City, California. 1969 Ocean Charter w/ 2 inboard Detroit diesel engines, one was completely rebuilt in 2012, has Sea Tek auto pilot, Humminbird 780 GPS, depth finder, fish finder, new Furuno 1622 radar, Icom VHF, dockside power, downriggers, outriggers, rod holders, hydraulic steering, dual batteries, wood flooring, storage, galley, complete walk-around deck, professionally maintained, documented. Custom built fiberglass vessel ready for ocean charter fishing. Open to offers. 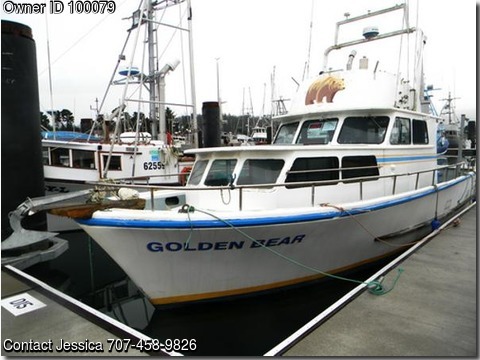 1969 Charter Boat- 2007 Survey-Cruising speed: 20 knots. Fuel tanks: 2, stainless steel, 450 gallons total. Galley sink, Head, 60 gallon water tank. Rudders: Dual, bronze 16" w x 22" d.
GPS: Hummingbird 780 C, Micrologic, ML-5500 Loran C.
Auto-pilot: Setec Bemar 21 R.
Compass: Danforth/White express 6" cad. Batteries: 12 v dual 8D each separate for each engine.